Anyone who has ever seen a photograph or postcard of the Hawaiian Room knows that Kanahele’s vivid description comes close to realizing what is otherwise indescribable with mere words. The Hawaiian Room was a Polynesian oasis in the middle of a burgeoning concrete jungle. But those who were there know that the real magic was in thepeople – the musicians and dancers who took a chance, left home and family, and struck out from their Pacific paradise for the strange and mysterious East Coast, their only collateral their unique culture. I could spend hours recounting the story of the Hawaiian Room. Growing up in New Jersey – a train ride from New York City – in a family that performed Hawaiian music professionally, I was no stranger to the names that made the Hawaiian Room famous (and vice-versa). My father, a steel guitarist who eventually led his own revue, cut his teeth working with Tutasi Wilson, a Hawaiian Room choreographer, and Sam Makia, a steel guitarist with several groups that played the room. Our home was filled with the records made by the Hawaiian Room musicians – most recorded in and around New York City, most as easy to find as a walk to your nearest Woolworth’s. I want to tell the story, but it’s not my story to tell. While many – perhaps most, maybe all – of the musicians of the Hawaiian Room are now gone, many of the hula dancers who worked the room – a generation (or more) younger than the bandleaders – thankfully remain with us. On January 11, 2014, the Hula Preservation Society – bolstered by a number of these ladies of hula, or “Ex-Lexes” as they joyously refer to themselves – launched a Kickstarter campaign to fund the making of the documentary film about their life at the Lexington Hotel’s Hawaiian Room. There clearly remains interest in the story since, by February 20, the project was fully funded – more than 150 individuals and organizations contributing more than $20,000 to ensure this story is told. And the beautiful film that resulted premieres Friday evening, October 10, 2014 in New York City. I was pleased and honored to take part in this celebration. With my frequent musical partner, fellow New Jersey-born Hawaiian music enthusiast, vocalist, and multi-instrumentalist Andy Wang – we performed traditional Hawaiian music before the film and – much better still – accompanied the “Ex-Lexes” in a medley of their favorite hula numbers after the film showing. Joining us was venerable Hawaiian diva Amy Hanaiali`i Gilliom whose grandmother, Jennie “Napua” Woodd, was a dancer and choreographer in the Hawaiian Room too. I am proud to be the second generation of my family’s musicians to associate with the legends that made the Hawaiian Room what it was. And while the Hawaiian Room story may not be my story to tell, sometimes the music speaks for itself. So in the days leading up to the film debut, Ho`olohe Hou Radio featured the stories and music of the musicians of the Hawaiian Room. You would be surprised and amazed who abandoned their beautiful Hawaiian life to share their unique culture beyond the boundaries of their island home. And you might be amazed at what wonderful Hawaiian music was born of the collaborations forged in The City That Never Sleeps. 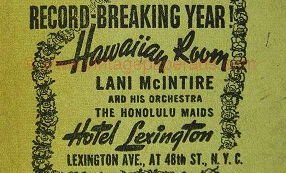 Click on the links below to read the stories and hear the music of the gentlemen and ladies of the Lexington Hotel’s Hawaiian Room. And congratulations to the Hula Preservation Society on your tremendous achievement and a huge mahalo for letting me take part in your monumentous occasion. Al Kane and Sam Macy – Dual Steel Guitars in The Hawaiian Room?